I love your new teacup Terri. So pretty! And isn't pink and green a spring pallette?! What a lovely pink teacup Terri! Thank you for hosting. Have a nice week. Your new teacup is singing springtime! I love the pinks and green of it. The daisies inside the cup make it extra special. Very pretty find! Thank you for sharing and coming to tea. Terri, what a beautiful teacup you've shared from your Asheville trip. What a wonderful giveaway you won, too! One of my favorite quotes...just love it! And I love your exquisite tea cup. She's a real beauty with her soft pastel colors and sweet flowers. Such a pretty post! Queen Anne in this shape is very elegant. I think I only collect this shape by Queen Anne. It's your fav color and mixes well with soft pink and hot pink handle. The daisies look so soft and it's like the flowing tea leaves in cup. I hope you will make great progress with your drawing. I wish to learnt to paint too one day. Oh, your pink daisy cup is so sweet! Gorgeous pastel colors. I'm so glad it found a new home. I know it must be tiresome to read the same words..."what a lovely teacup", or "I love that teacup", but I do ! I do! The colors all together are simply beautiful. I am glad you are back to drawing, and look forward to seeing more. 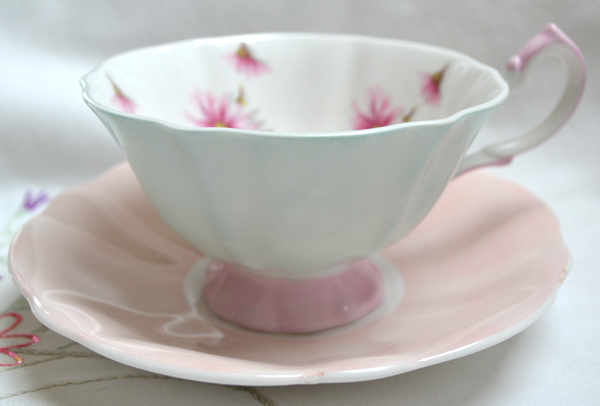 A very pretty tea cup and I like that the real pretty is on the inside! Sort of like a surprise! I love the quote and the photo you have posted to start off my day, it is beautiful! 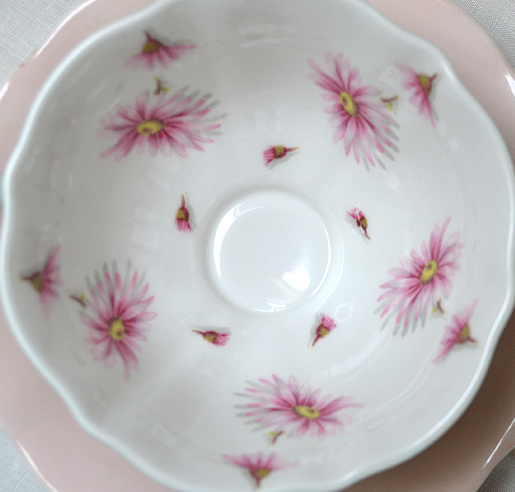 Your teacup is gorgeous with the dainty flowers...I always find flowers so inspiring. Your selection of tea looks quite interesting, and tempting....enjoy! Hugs! your flower photo is pure artwork and withe the quote it makes a wonderful greeting card. 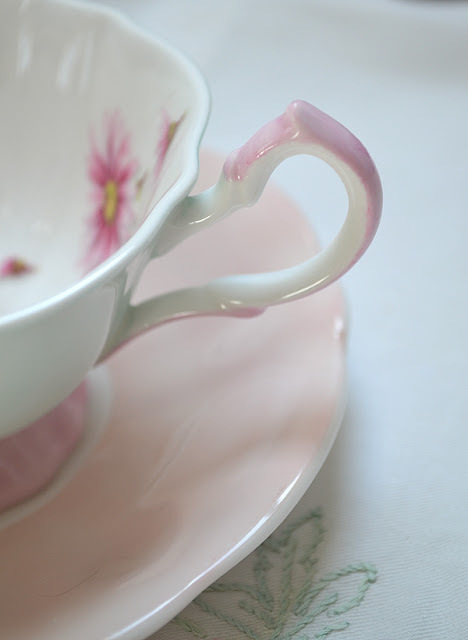 That tea cup is so charming with the cute daisies inside. The soft pastel colors have been chic in the 50th. The come in vogue again at this time. And tea for a giveaway is just perfect for you. You drawing looks wonderful. Thank you for sharing all your skills and for hosting this sweet event. I see this week's mood is beauty and romance in a cup of tea! All your photos of this lovely and elegant tea cup are amazing, but the first one of the flower with the caption is really art work! Thanks for hosting another special tea, dear Terri! Hi Terri, such a beauty this teacup and your drawing is excellent!! Have a beautiful day. 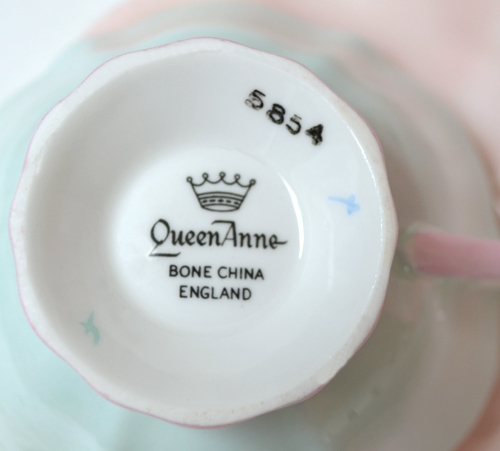 When I looked at the pictures of your Queen Anne teacup, all I could think of was "this is very Terri!" The colors, the delicate balance of form ~ and it has a gentleness about it. Lovely. 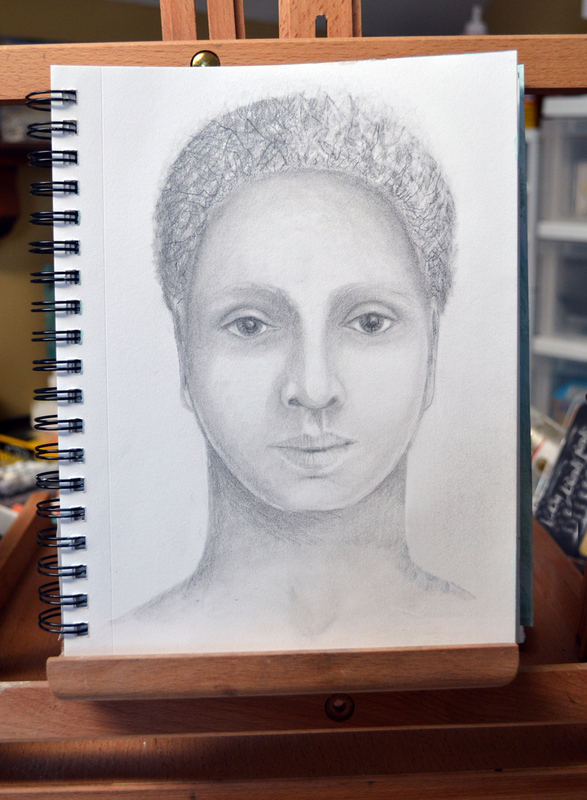 Your drawing is amazing and I'll be looking for updates on your progress! Have a lovely, Spring week my friend. The tea cup is so pretty... I love the pastel colours. I think your *Plain Jane* cup is quite lovely. Love the pale pastel colors and the dainty flowers on the inside. Glad you are back to drawing. Great tea selection! Happy Tea Day! Such beautiful cups Terri. Thanks for hosting! je n'avais jamais vu de tasse avec juste le décor de fleurs à l'intérieur! I'm loving the tea cup you featured in your post. The pale green on the outside against all of the pale pink. So pretty. And what a happy packet to recieve from dear Sharon- I know you are enjoying them all after tour! Your drawing is amazing,-and her little hair already looks fantastic! Hi Terri..one of my favorite quotes..Anais Nin is brilliant! That is a quote that has truly set me free in my journey many times! Such a beautiful post..lovely cup..love the delicate colors! and Wowness..you are a brilliant artist..so beautiful..such compelling eyes..and gorgeous shading....can you come by and draw with me , teach me some tips..and have some tea?..such fun! Beautiful post! Blessings of Spring! Your teacup is pretty, I like the two pastel colours together. Also, a nice selection of green teas to try. I adore the tea cup you posted...the colors are so very scrumptious... I love that shade of green and the pink is such a delicate compliment to the green. And the flowers inside the cup is what always makes a tea cup seem to be alive! Oh, and the tea you were drinking sounds divine! What a gorgeous teacup you discovered! Isn't it wonderful when we have the chance to save these little works of art from obscurity and neglect? May every sip of tea you take from it bring you good health and happy memories. Oh I think this is my all time favorite teacup. I love the solid color on the outside with flowers in. Just lovely. Hello!! Since applications have news on the blog!! A video about Cross Stitch!! For beginners like I was in November 2012 ... You can!! Come see and be inspired! 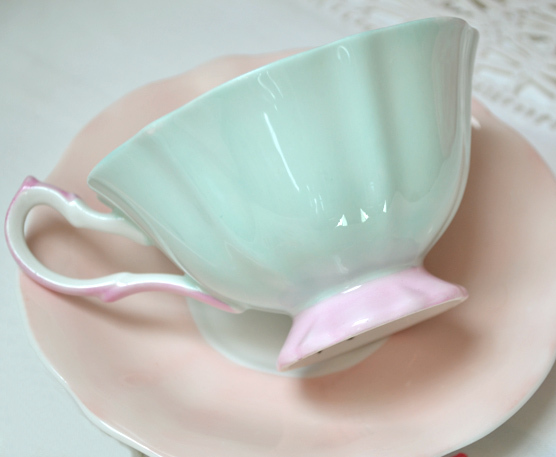 What a beautiful pink cup and saucer. You are doing great on your drawing! That’s a nice selection of tea you’ve got there. Oolong is one of my all-time favorite tea, along with Jasmine; and I see you have both! Have you tried the Jasmine Pearls yet? 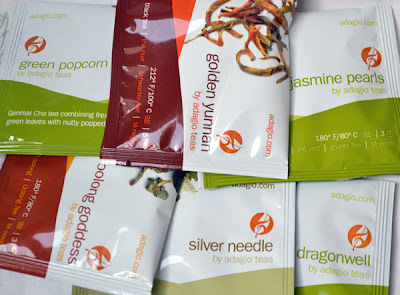 Adaigo has a nice variety of teas in stock, though I haven’t tried most of them yet. I usually just stick with my favorites.